First published on December 17, 2015. Genesis 22 has the story of the great test of faith of Abraham. God called to Abraham one day, and Abraham answered “Here I am!” God told Abraham to sacrifice his son Isaac, his only son, who Abraham loves. Abraham was to do this on Mt Moriah, a place God initially told Abraham would be a place I will tell you. Not even initially knowing where, Abraham hastened to obey, and the two hiked to the fateful spot. Theologians have examined this scene and compared it to Christ’s sacrifice so I am certainly not plowing new ground. I have no deeper insights. But in this day and age, with fears and tribulations, and griefs and apostasy, it is always refreshing to keep our eyes on Christ. It is always edifying to see how in the word, the LORD God has it all under control and His plan is unfolding from that day to this in magnificent fashion, and will continue to do so. 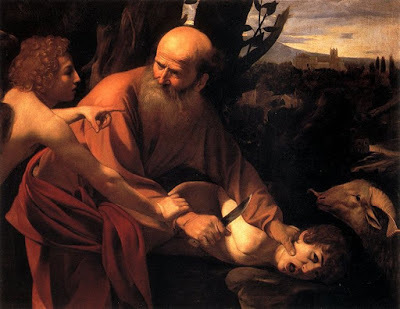 Italian Renaissance painter Caravaggio’s depiction of the sacrifice of Isaac. 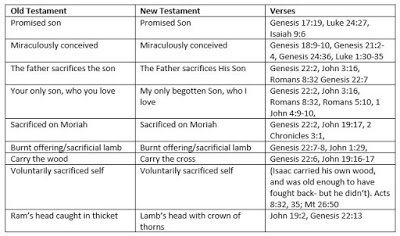 Comparison of Old Testament texts with New Testament texts. Isaac pre-figures Christ. Scripture is amazing and wonderful. Read your Bible today.